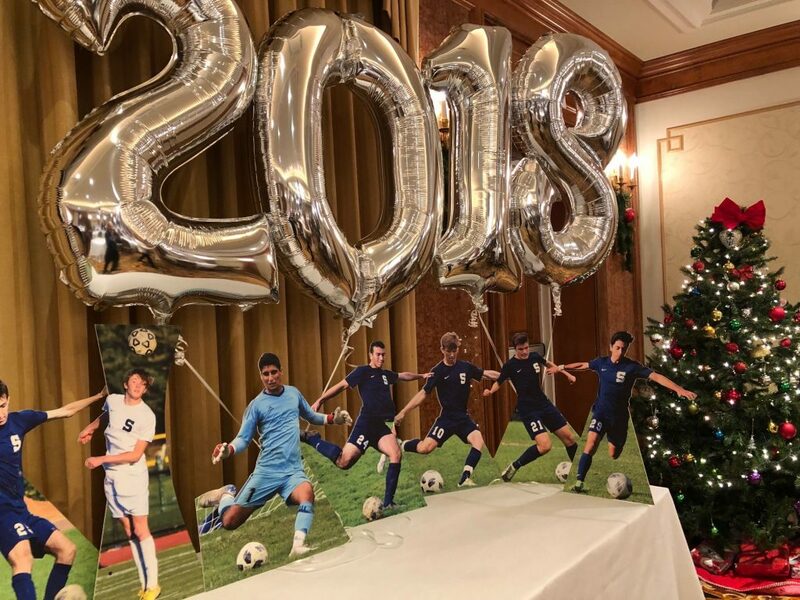 The final event of the 2018 season — the 60th annual Staples High School boys soccer banquet was held tonight. Like the 60th anniversary celebration in October, it was a cause for pride, reflection, memories, joy and love. Over 200 players, parents, siblings and friends honored the varsity, reserve and freshman teams. The Norwalk Inn event included heartfelt speeches by coaches and athletes, and several awards. Head coach Dan Woog noted the evening’s several themes. 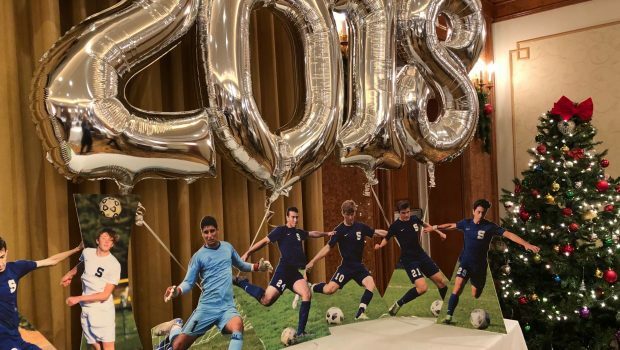 There was sadness that the varsity team was together for the last time; pride in on-field achievements, including playing with skill, poise, grace, toughness and creativity; satisfaction in setting lofty goals and reaching many of them, and eagerness in looking ahead to 2019. Throughout the night, Woog cited the 2018 team’s commitment to honoring their legacy — and adding one more page to Staples soccer’s storied history. The 2 Block “S” awards went to Nick DiMasi and Rob Diorio. In a vote by teammates, DiMasi won the Most Valuable Player Award. Woog cited the high-scoring attacker for his ability to overpower defenses; his willingness to shoot often, and his many key goals. Diorio received the Most Improved Player Award. The defender — like DiMasi, a reserve player a year ago — worked hard to earn a starting spot, then got even better match by match. He helped anchor a back line that played excellent team defense — but added some great moves himself going forward. Vaughan Sealey earned the $2,500 Top of the Hill Team scholarship, in recognition of his hard work in the classroom and on the field. Woog also announced that Tom Henske has been named FCIAC Assistant Coach of the Year. That’s the first step on the road to possible state and national honors. The evening included strong speeches by coaches and captains. All highlighted not just wins and losses, but the unbreakable bonds and important lessons each season has taught. A superb slide show, created by Armelle Daniels, was another evening highlight. The banquet concluded with the announcement by Baltierra of next year’s #15. He passed the symbolic jersey — worn by Preston Hirten ’07, symbolizing tenacious play, passion for soccer and deep commitment to the Staples program — to Surya Balaji. Baltierra offered a heartfelt speech about Preston, and the importance of the #15 tradition. A non-varsity award was presented by freshman coach Chris O’Dell. Bruno Guiduli received the Stephen Martin Award. It is presented annually to a freshman player or players who best epitomize Steve’s “special spirit, by combining the desire to excel with the willingness to work and the eagerness to share.” Reserve coaches Russell Oost-Lievense and Reilly Lynch named their Most Valuable and Most Improved players: Lars Djuve and Colin Corneck, respectively.